Pope Francis established the Eparchy of St. Thomas the Apostle – Melbourne of the Syro-Malabar (Sancti Thomae Apostoli Melburnen (sis) Syro-Malabarensium) on 23 December 2013 and the news was published on 11 January 2014. The Pope appointed Bishop Bosco Puthur, Eparchial Bishop of St. Thomas the Apostle of Melbourne of the Syro-Malabars and Apostolic Visitor of the Syro-Malabar faithful residing in New Zealand. The formal inauguration of the Eparchy and Installation of Bosco Puthur as its first bishop took place in St. Patrick’s Cathedral, Melbourne. Bishop Bosco was born on 28-05-1946 at Parappur, Trichur. He was ordained priest on 27-03-1971. He has the educational qualifications of L.Ph; S.T.L; S.T.D. He had his seminary formation in St. Joseph Pontifical Philosophical Seminary, Carmelgiri, Aluva and Propaganda College Rome. After his ordination he took Doctorate in Systematic Theology from the Catholic University of Leuven, Belgium. He served as Asst. Vicar, Ollur (1976), Fr. 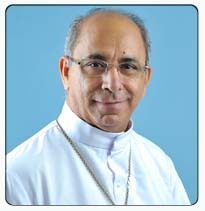 Prefect, Minor Seminary (1976), Professor at St. Joseph’s Seminary Aluva (1977-1992), Rector, Minor Seminary (1992), Protosyncellus of the Archdiocese of Trichur (1995-1999); Cathedral Vicar (1999), Executive Director of Liturgical Research Center, Mt. St. Thomas, Kakkanad (1999-2005). When he was nominated the first Curial Bishop of Syro-Malabar Major Archiepiscopal Curia, he was working as the Rector of the St. Joseph Pontifical Seminary, Mangalapuzha (2005-2010). He was appointed Curial Bishop and Titular Bishop of Foraziana on 18 January 2010 and was ordained bishop on 13 February 2010. He is the Secretary of the Synod of the Syro-Malabar Church. Fr. Francis Kolencherry is the Protosyncellus (Vicar General) of the Eparchy.